Gene delivery systems are used to deliver therapeutic drugs targeting a specific area. Gene delivery is a procedure that introduces foreign DNA into host cells. 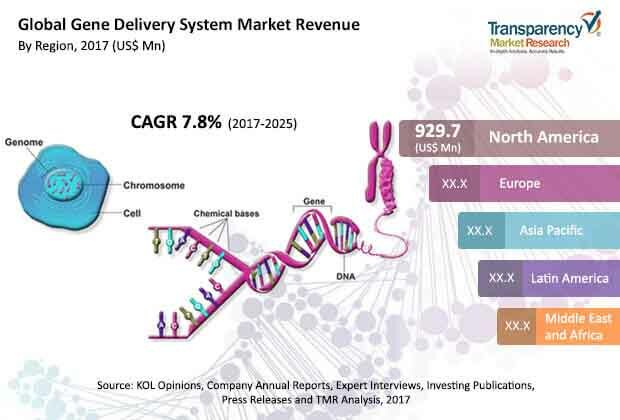 The global gene delivery system market was valued approximately US$ 2,227.8 Mn in 2016 and is anticipated to expand at a CAGR of over 7.8% from 2017 to 2025 to reach value of nearly US$ 4,281.0 Mn by 2025. Increase in demand for targeted therapies and rise in technological advancements are likely to fuel the global gene delivery system market from 2017 to 2025. The global gene delivery system market is driven by increase in need for advanced technologies for targeted systems. Launch of new and advanced technologies, rise in demand for targeted and low dose frequency drug delivery, increase in investment in research & development, surge in demand for self-administration devices for home health care, and increase in prevalence of chronic life-threatening diseases are driving the global gene delivery system market. However, high cost of the treatment and increase in drug recalls due to stringent regulations in developed countries are likely to restrain the market. The global gene delivery system market is segmented according to delivery system, application, route of administration, and geography. According to delivery system, the global gene delivery system market is divided into viral gene delivery system, non-viral gene delivery system, and combined hybrid system. The viral gene delivery system is further classified into adenovirus system, lentivirus vector, retrovirus vector, adeno-associated virus vector, sendai virus vector, herpes simplex virus vector, and others. The non-viral gene delivery system is further segmented into natural organic compounds, physical methods, and chemical methods. In terms of revenue, the viral gene delivery system segment dominates the global gene delivery system market. Increase in demand for viral gene delivery systems for the treatment of genetic and acquired diseases caused by insertion or deletion of a gene drives the segment. The combined hybrid delivery system segment account for a small share of the market. Based on application, the global gene delivery system market is segregated into infectious diseases, oncology, ophthalmology, urology, diabetes, CNS, and others. In terms of revenue, the oncology segment dominates the global gene delivery system market. Rise in incidence of cancer across all regions drives the global gene delivery systems market. According to WHO report (2017), around 1 in 6 deaths occurs due to cancer globally. CNS is the second largest segment boosting the market. Increase in incidence of neurological diseases is likely to drive the segment by 2025. According to EurekAlert, neurological disorders is a leading cause of death globally. Diabetes is also a chronic disease which affects majority of population across the globe. According to WHO report, in 2016, around 1% of total deaths occurred only due to diabetes in Japan. In terms of route of administration, the global gene delivery system market is segmented into oral, injectable, inhalation, transdermal, ocular, nasal, topical, and others. The injectable segment dominates the global gene delivery system market. The oral and injectable segments together accounted for 62.4% share of the market in 2016. The injectable route of administration is used for rapid drug absorption. Especially, drugs with low oral bioavailability are administered through the intramuscular or subcutaneous route. Oral formulations are inexpensive as compared to other dosage forms. This route of drug administration allows sustained release of formulation to reduce the frequency of the medication. These are some of the factors driving the segment. The inhalation segment accounts for less share of the global gene delivery system market. Drugs targeted for the treatment of lung diseases such as bronchodilators and steroids can be inhaled to achieve rapid action. This is likely to boost the segment. Based on geography, the global gene delivery system market is segmented into North America, Europe, Asia Pacific, Latin America, and Middle East & Africa. North America dominates the global gene delivery system market. North America and Europe together accounted for 72.4% share of the market in 2016. Rise in prevalence of chronic diseases in the U.S. and Europe and technological advancement in drug delivery systems are driving the global gene delivery market. Rise in prevalence of acute and chronic diseases in the U.S. drives demand for drug delivery systems in the country. According to WHO report (2016), cancer accounts for around 23% of total deaths in the U.S. Demand for drug and gene delivery system is increasing in the region due to increase in prevalence of several chronic diseases. According to WHO report 2016, around 40% of total death in Germany were caused by cardiovascular diseases. The global gene delivery system market in Asia Pacific is projected to expand at a rapid pace due to increase in prevalence of diseases and rise in investment of key players in this region. The market in Middle East & Africa is likely to expand at a sluggish pace. Major players operating in the global gene delivery system market include Novartis AG, Amgen Inc., Oxford BioMedia plc, SIBIONO, Shanghai Sunway Biotech Co. Ltd., Pfizer Inc., Bayer AG, Johnson & Johnson Services Inc., Human Stem Cells Institue, and Epeius Biotechnologies Corporation. These players adopt organic and in-organic growth strategies to expand their product offerings, expand geographically, increase customer base, and garner market share. This report analyzes the current and future scenario of the global the global gene delivery system market. Rise in investments for R&D of novel advanced technologies, increase in incidences of chronic diseases such as cancer, surge in demand for gene therapy, and rise in awareness regarding treatment options expected to drive the market. Gene delivery systems are used to deliver therapeutic drugs to a targeted area. Gene delivery is a procedure to introduce foreign DNA into host cells. The global gene delivery system market is segmented according to type of delivery system, application, route of administration, and geography. The global gene delivery system market report comprises an elaborate executive summary, which includes a market snapshot that provides information about various segments of the market. It also offers data analysis of the global market with respect to the segments based on type of delivery system, application, route of administration, and geography. A detailed qualitative analysis of drivers and restraints of the market and opportunities has been provided in the market overview section. Moreover, the section comprises competitive matrix and company profiles with business overview to understand the competitive landscape in the market. This section of the report also provides market attractiveness analysis, by geography, and market share analysis by key players, thus presenting a thorough analysis of the overall competitive scenario in the global gene delivery system market. Based on delivery system the global gene delivery system market is segmented into viral gene delivery system, non-viral gene delivery system, and combined hybrid system. The viral gene delivery system is further classified into adenovirus system, lentivirus vector, retrovirus vector, adeno-associated virus vector, sendai virus vector, herpes simplex virus vector, and others. The non-viral gene delivery system is further divide into natural organic compounds, physical methods, and chemical methods. The market size and forecast for each of these segments have been provided for the period from 2015 to 2025, along with their respective CAGRs for the forecast period from 2017 to 2025, considering 2016 as the base year. Based on application, the global gene delivery system market is segmented into infectious diseases, oncology, ophthalmology, urology, diabetes, CNS, and others. The oncology segment dominates the market. The market size and forecast for each of these segments have been provided for the period from 2015 to 2025, along with their respective CAGRs for the forecast period from 2017 to 2025, considering 2016 as the base year. In terms of route of administration, the global gene delivery system market is segmented into oral, injectable, inhalation, transdermal, ocular, nasal, topical, and others. The injectable segment dominates the market. The market size and forecast for each of these segments have been provided for the period between 2015 and 2025, along with their respective CAGRs for the forecast period from 2017 to 2025, considering 2016 as the base year. Based on geography, the global gene delivery system market has been categorized into five major regions and key countries in the respective regions: North America (the U.S., Canada), Europe (the U.K., Germany, France, Spain, Italy, and Rest of Europe), Asia Pacific (India, China, Japan, and Rest of Asia Pacific), Latin America (Brazil, Mexico, and Rest of Latin America) and Middle East & Africa (South Africa, GCC countries, Israel, and Rest of Middle East & Africa). The market size and forecast for each of these regions and the mentioned countries have been provided for the period from 2015 to 2025, along with their respective CAGRs for the forecast period from 2017 to 2025, considering 2016 as the base year. The research study also covers the competitive scenario in these regions. The report also profiles major players operating in the market and provides various attributes such as company overview, financial overview, product portfolio, business strategies, and recent developments. Major companies profiled in the global gene delivery system market are Novartis AG, Amgen Inc., Oxford BioMedia plc, SIBIONO, Shanghai Sunway Biotech Co. Ltd., Pfizer Inc., Bayer AG, Johnson & Johnson Services Inc., Human Stem Cells Institute, and Epeius Biotechnologies Corporation.